These days, many homeowners are interested in going "green." But can you protect and preserve the environment and save money too? Although many eco-friendly improvements (like buying new energy efficient appliances) can be expensive, there are many ways to "green" your lifestyle that can actually save you money. While some may involve a small investment upfront, they'll pay off quickly. Here are some ideas on how to get started. 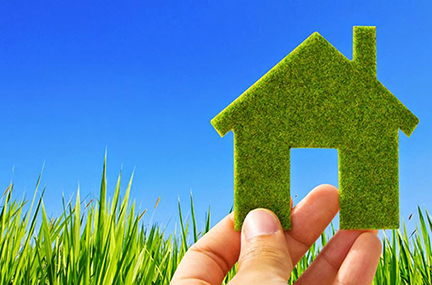 What better place to start your new green living than at home? After all, it's probably where you and your family spend most of your time. And a quick walk through the place may clue you in to a few simple changes you can make that will save you cash. To maximize your savings, you could hire an energy auditor, a professional who comes to your home and evaluates its energy efficiency. The auditor will help you locate weak weatherstripping, ineffective insulation, and more. While energy audits usually cost $300-400, they can pay for themselves over time as your energy costs decrease. Many people believe happiness is a feeling of pleasure based on some external happenings -- you got the raise you wanted, you ate a fabulous meal. "Research has shown that people who do not have strong support from friends and family live shorter lives and suffer more from stress," says Cheryl A. Richey, Ph.D., professor of social work at the University of Washington. "Support from friends can give people the strength to make positive changes in their lives, like staying away from drugs or leaving an abusive relationship." When help is needed call 800-433-2320. The intake counselor will ask for your name, employer and a brief description of your presenting concern. If an emergency exists you will be given immediate assistance. If your situation is not an emergency, you will be offered telephone assistance and/or in-person sessions to complete an assessment and make a referral for treatment if needed. 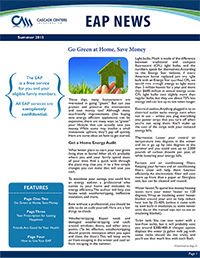 Download the entire copy of the Summer 2015 Newsletter under “Downloads” to the left.